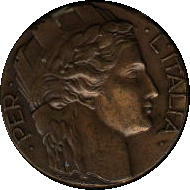 Resource material on Italian Medals & Regalia is scarce, unlike its more famous Axis partner, Germany. This is my attempt to create a valuable on-line guide as a resource for collectors. Included are medals, insignia, and uniforms related to the period. In addition, a small amount of material pre-1922 and post-1945 is included. I need your help!!! If you have material to contribute to this virtual collection, please contact me.